The scholarly view of La Malinche is that she was a courageous but naive young woman with no mind of her own who blindly went along with a conversation to Christianity without knowing any better, and who was a traitor to her own people because she assisted Cortes in conquering the Aztecs by dumbly translating his every word out of some teenage puppy love for the Conquistador. This notion of her betraying her native people is made even more heinous because the Aztecs are often viewed as some super sophisticated society whose benefits are forever lost to humanity after a bloodthirsty Cortes ‘annihilated’ them. The final nail in Malinche’s coffin by such scholars is to suggest ultimately she was unimportant because Cortes mentioned her only twice in his letters to the King of Spain. The author of this website rejects all these views. Let’s turn these notions upside down and see what falls out. 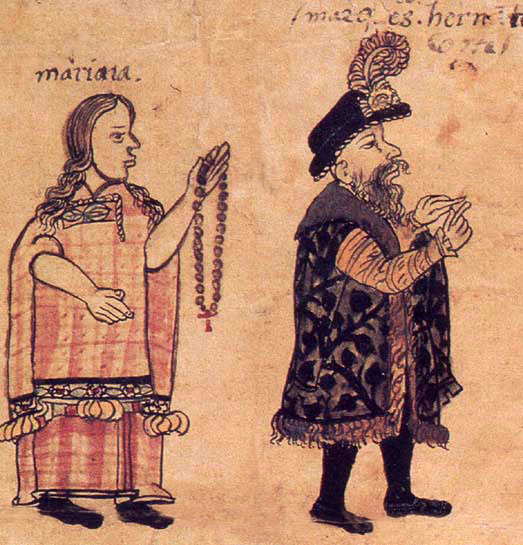 Malinche’s (or Malinalli at the time) conversion to Christianity or really Catholicism was probably significant to her only because the Spanish ‘God’ preached love for His followers and most importantly prohibited human sacrifice. Remember that Malinche grew up under Aztec rule and as such was undoubtedly aware of her fellow men, women, and even children in the village being dragged off by the Aztec to end up as sacrifices to the gods. Who wouldn’t, in her situation, seek out a new god who would be against that? There is also evidence to suggest that many natives at the time (including the Emperor Montezuma) believed that the return of their important god Quetzalcoatl was imminent and by a stroke of fate Cortes fit the description of this god exactly. It is quite probable that Malinche believed this and when she met Cortes recognized him as Quetzalcoatl, all the more reason to go along with him and whatever he said. Now it is pretty clear she soon realized that Cortes was not a god, but Malinche then found herself with quite the propaganda weapon she could use when dealing with other tribes and the Aztecs. She could scare the hell out of them by reinforcing this notion that Cortes was a god. Next let’s examine the view that Malinche was only a simple translator for Cortes. The fact is that the Spanish could not communicate or understand the natives, including the Aztecs. They had only one man who could understand the locals where they first landed. So in fact, when Malinche was translating they could only assume what they told her to say was what she actually said! Suppose she took it upon herself to change the meaning of Cortes’ words? Suppose she did reinforce the idea that he was Quetzalcoatl returned? How much more willing did it make the various tribes to ally with the Spanish? We’d say quite a lot. Malinche may have even used this ploy on Montezuma himself. After all he invited the Spanish into his palace! Finally let’s look at the Aztecs, a magnificent and advanced people, that historians say were wiped off the earth by the evil bloodthirsty European conqueror Cortes. The truth is the Aztecs, for all their ‘advanced’ society and structure, were more bloodthirsty than Cortes could ever imagine. They sacrificed hundreds of thousands of victims alive. There is evidence to suggest that their priests, at least, were cannibals because they consumed the flesh and blood of their ritual victims. So it is debatable just how much the fall of the Aztecs was some atrocity, and probably was certainly welcome by the other native tribes at the time. Moments in history such as the conquest of Mexico are unique. If Malinche hadn’t been involved would Cortes have been successful? Maybe he would have found another interpreter, maybe he would have found a way, maybe… But maybe too, that unique moment would have passed and history would have been vastly different. That’s why we think Malinche changed the course of history and therefore deserves a prominent place in it. This entry was posted in Aztecs, Cortes, Feathered Serpent, Malinche, Uncategorized. Bookmark the permalink.